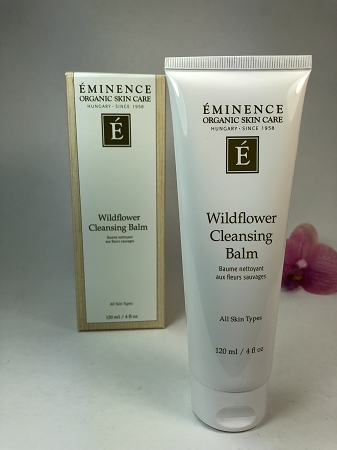 Eminence Organics Wildflower Cleansing Balm is an antioxidant rich cleansing gel balm to help nourish the skin leaving a soft, supple and hydrated complexion without the greasy residue. Featuring Elderflower (astringent) and Poppy Seed Oil (rich in fatty acids) to help reduce inflammation and restore hydration. Apply a thicker layer as a nourishing and purifying masque, leave on for 5-10 minutes before rinsing. •Evening Primrose: Helps to calm and reduce inflammation. Source of fatty acids. •Primula Oil: Helps reduce inflammation and redness while nourishing and hydrating the skin. •Linden Flower: Antioxidant that supplies bioflavonoids to help nourish and rejuvenate the skin.